We are delighted to have gained planning permission in Wandsworth for a private client project on Honeywell Road, in between the commons in Battersea. 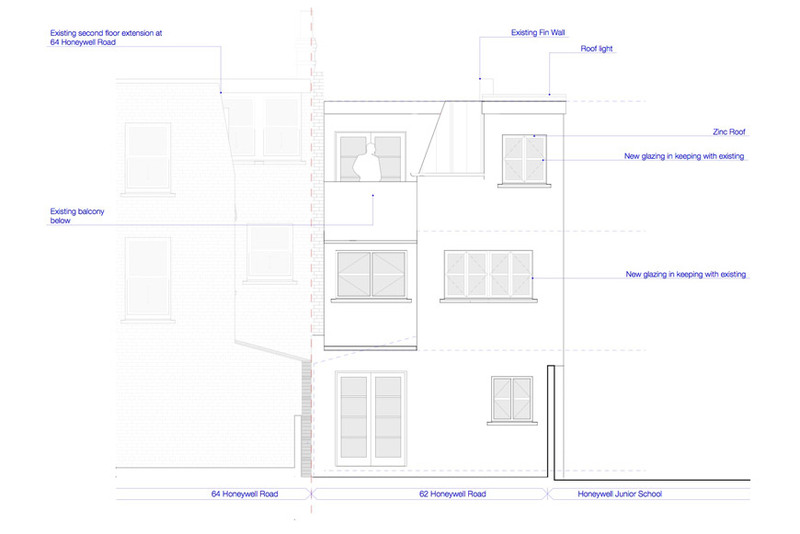 The project is a rear extension at first and second floors along with a new roof terrace. It’s an exciting project because of the building’s contemporary design, which differs from the architectural vocabulary of the area with its primarily Victorian terraced, London stock brick buildings. Our client’s property was only built 18 years ago and has angled white rendered walls, a flat roof, decorative black window frames and doors with a balcony located on the first floor. This existing design has allowed us to continue designing a contemporary concept for the extension. We have extended the white rendered walls upwards, with the extension of the first and second-floor areas and included a new zinc dormer and mansard roof. There is a new roof terrace that is enabled by the existing flat roof, but we’re incorporating a new set of stairs to connect the second floor with this new outdoor space. The motivation behind the project is to create a more suitable family living space. The new plan provides an additional bedroom, increased storage, extra bathrooms and storage from the first floor upwards. On the ground floor, we have reconfigured the kitchen to make it more family-friendly and created a new utility space under the stairs. This will give our clients the option of opening the kitchen up to the living space through a large sliding door. We’re really pleased to have gained this planning consent from Wandsworth Council. With every planning application, no matter how beautiful or innovative the design, there’s always a chance the local authority will refuse it. But, not this time. We’re having a very good run of success in gaining planning consents recently too. We’re now progressing with this project and moving on to RIBA stages 3 & 4, where we’ll be working through the technical and interior design details. We’ll shortly be on site too, when we’ll get to manage our design as the contractors bring it to life. Please get in touch if you would like to discuss some works you are planning or for help with gaining planning permission in Wandsworth.